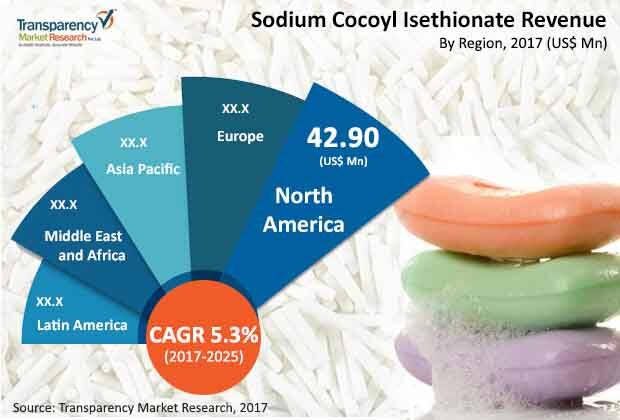 The growing number of manufacturers of sodium cocoyl isethionate (SCI) renders the global market largely competitive, notes Transparency Market Research (TMR). However, the vendor landscape is increasingly favorable toward large chemical companies who possess technical expertise to produce compounds that are moisture free. The paucity of advanced manufacturing technologies in small-scale manufacturers may keep them away from the lucrative gains. TMR observes that several prominent chemical manufacturers are actively engaged in research and development activities with the move toward wider commercialization of SCI-based products across the globe. Top players adopt merger and acquisition as the key strategy for consolidating their shares. This helps in bolstering their sales channel and boost their technical capacity for end-product formulation. Top players include AkzoNobel N.V., Galaxy Surfactants, Huanggang Yongan Pharmaceutical Co., Ltd., BASF SE, Clariant International AG, and Innospec Inc. The global sodium cocoyl isethionate market is projected to rise at a CAGR of 5.3% during the forecast period of 2017–2025. The market stood at US$125.1 million in 2016 and is anticipated to rise to a worth US$197.4 million by the end of the assessment period. The various applications of SCI are products pertaining to skin care, hair care, oral care, and baby care. Of these, SCI-based skin care alone accounted for over 40% of the total global consumption in 2016. The segment is expected to retain its dominance in the coming years as well, driven by the rising demand for this plant-based alternative in skin cleanser products. Geographically, the combined share of North America and Europe exceeds 40% of the global demand for SCI in 2016. The dominance of these regional markets is likely to continue over the forecast period, attributed to a robust personal care industry in the regions and the large appetite for innovative products. The growth of the sodium cocoyl isethionate market rides on the back of substantial usage of its products in the cosmetics and personal care industry across the globe. The rapid strides that the personal care industry is witnessing in various parts of the globe is a potential factor supporting the rapid expansion of the market. The rising demand for plant-based mild surfactants as ingredients in a large variety of soap and skin cleansers among worldwide populations is a key factor propelling the demand for SCI. Attractive properties that underpin the demand for this surfactants are remarkable foam forming ability, marked moisturizing effect, and less skin irritation. The rising usage of SCI in numerous baby care products is accentuating the global market. The rising preference of plant-based ingredients over animal-based ones is fueling the demand for SCI as the surfactant is derived from coconut oil. In this regard, the trend toward the usage of sulfate-free and environmental-friendly ingredients in skin care products is also bolstering the uptake. The rising demand for sulfate-free shampoo is a case in point. Furthermore, the marked use of SCI in making premium personal care products is boosting the market. The rise in disposable incomes of populations in emerging economies is a key factor accentuating the market. The growing population of affluent middle class has led to the substantial demand for premium skin care products. This has bolstered the demand for SCI. The substantial need for safe as well as effective personal care ingredients, in developed regions, is influencing the positive demand for SCI. The advent of advanced cleanser based on sodium cocoyl isethionate surfactant has opened large lucrative avenue for market players. The study presented here is based on a report by Transparency Market Research (TMR) titled “Sodium Cocoyl Isethionate Market (Form - Needles, Powder, and Granules; Application - Hair Care, Skin Care, Oral Care, and Baby Care) - Global Industry Analysis, Size, Share, Growth, Trends and Forecast, 2017–2025”.